the more you love it. at Mount Tabor Music School (4110 SE Hawthorne, Portland, OR). 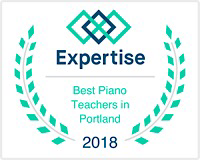 Rated as one of the Best Portland Piano Teachers for 2018! "Sarah is one of those rare pe﻿ople who can connect with a child (and adult) and allow them to open up to learning and creativity. I met Sarah when she was a teacher at Childswork Learning Center. She was our son's preschool teacher. After two years with Sarah, our son entered kindergarten, and we hired her to be his piano teach﻿er. She has an emotional connection to music that encourages others to become wrapped up in the experience of learning. As I watched her with my son, I decided to hire Sarah for my own piano lessons. It has been a great experience having Sarah in our lives for the last 5 years." We're social! Like us & check in any time!